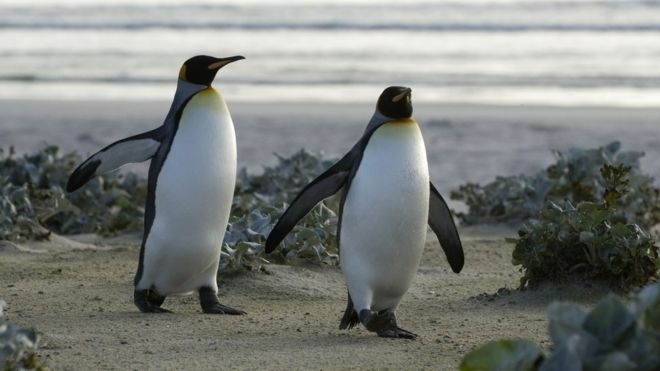 AKIPRESS.COM - The world's largest king penguin colony has shrunk nearly 90% since the 1980s, research suggests, BBC reports. Aerial and satellite images show breeding pair numbers have fallen 88% in the last three decades, an article in the journal Antarctic Science says. The colony lies on the France's uninhabited Île aux Cochons between Africa and Antarctica in the Indian Ocean. Researchers say there is no clear reason for the decline. The paper says that only 60,000 penguin pairs remain in photos taken in 2015 and 2017, down from half a million pairs recorded on a previous conducted in the 1980s. Second only to the emperor penguin in size, the king penguin breeds on the more temperate islands north of the Antarctic coast. Research published in February says some of the birds populations could be at risk from climate change.